Our president, Mr. NOUSAKU, is having a talk show at our shop in Bangkok Isetan on September 22nd and 23rd 2017. Under the title “New Challenges of NOUSAKU”, he will talk about our recent challenges together with introduction of our new office opened this April. Other than the talk show, TOYAMA fair will be held at the shop during the following period. If you live nearby, or are planning to stay in Bangkok during this period, please drop by and have a look at the fair. 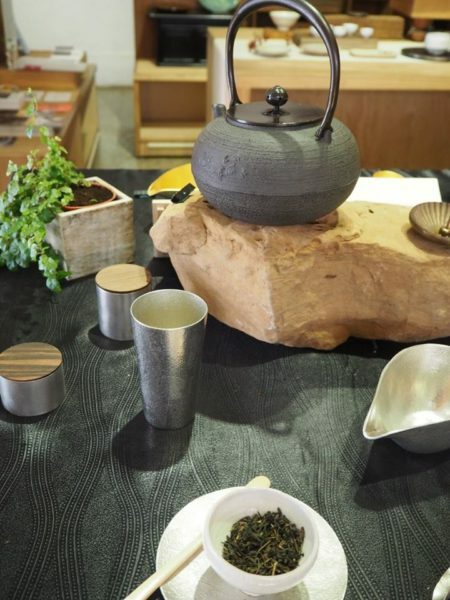 “Toyama Bunsou” handicraft exhibition is being held at the café&gallery CANS Tea & Book Shop, located in Taipei. 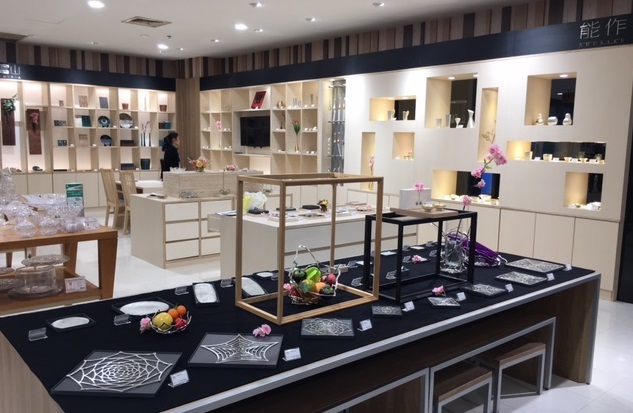 Nousaku products will be exhibited and available for sales together with some of the most famous representative manufacturers of Takaoka City, Toyama Pref. 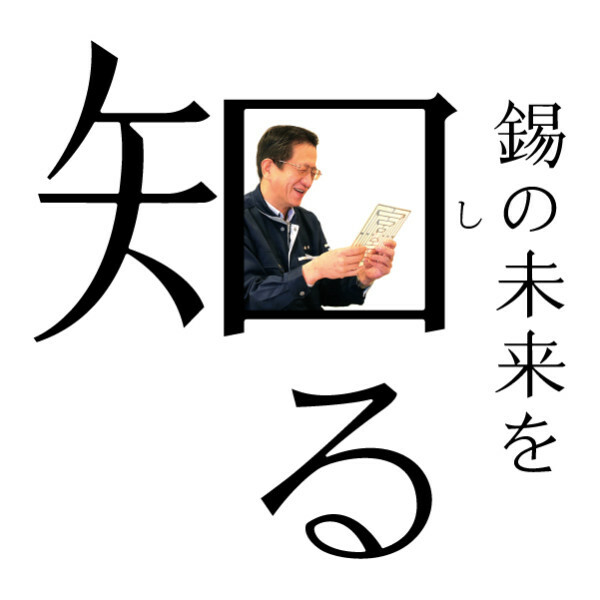 such as Momentum Factory Orii, Yamaguchi Kyujo, and Shimatani Syouryu Koubou. If you live nearby, or are planning to stay in Taiwan during this period, please drop by and have a look. 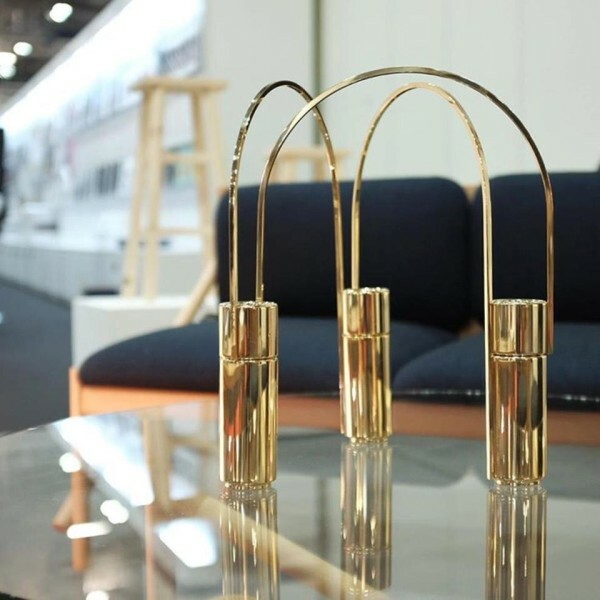 “Interior lifestyle Tokyo” held in Tokyo from June 14th. We hope you will visit our booth to discover our new items. We are looking forward to your visit. 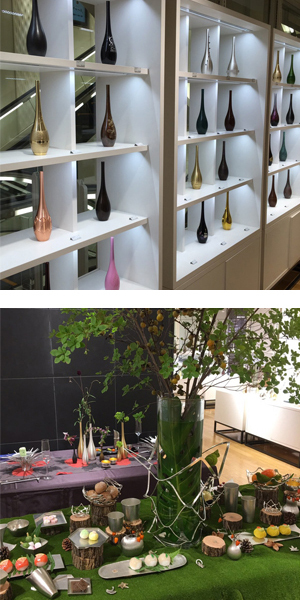 Celebrating the 100th anniversary of our foundation, we are holding the special exhibition “100 Sorori vases” at Taiwan. Sorori is a single-stem vase which has been recognized as one of the key items in a long history of traditional tea ceremony. With its traditional vase, we carried out the project featuring 100 stunning artisans in Takaoka to introduce the traditions and techniques handed down in our area. 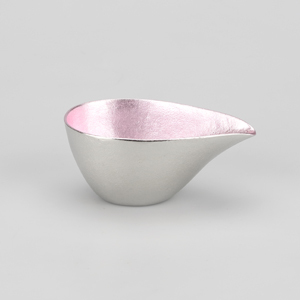 Besides the vases, our tin sake cups will be also available to purchase on site. 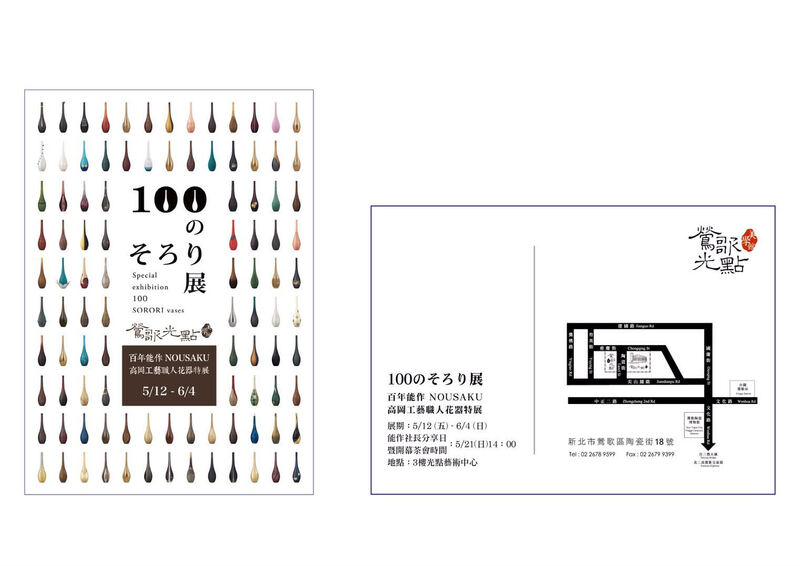 We hope you enjoy the art pieces which embody craftsmanship and feel the history of Takaoka through the exhibition. Our president will give a public talk at the venue from 2pm on May 21st (Sun). We hope you to visit the exhibition if you have a chance to be in Taiwan during the period. 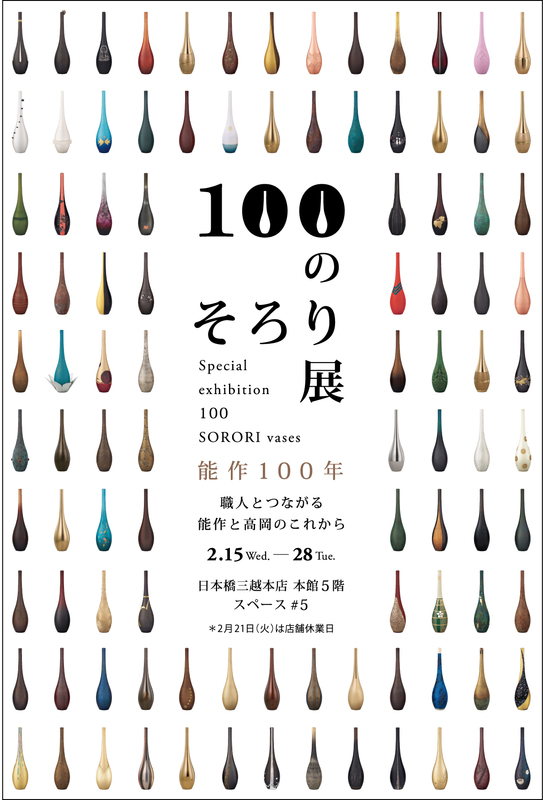 Celebrating the 100th anniversary of our foundation, we are holding the special exhibition “100 Sorori vases” at Nihombashi Mitsukoshi Department Store. Given their special finishing, each vase shows the superb craftsmanship. 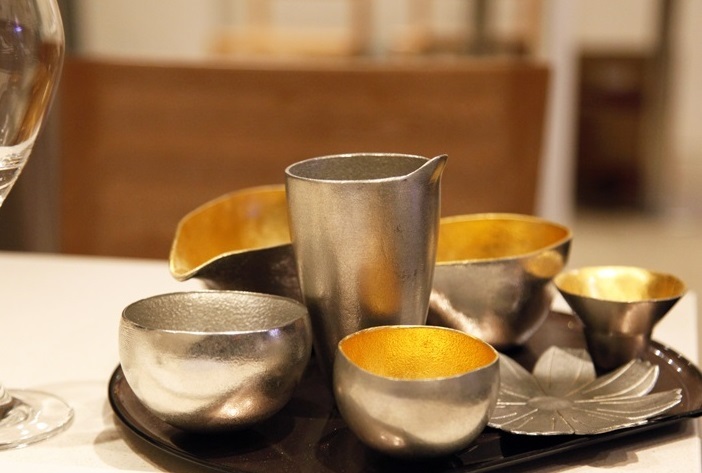 Besides the vases, our tin sake cups and brass home accessories will be also showcased at the same time. 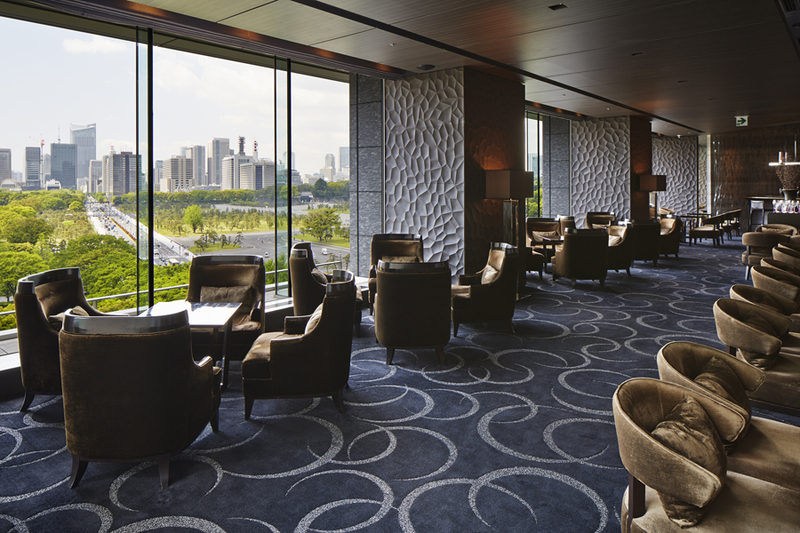 We hope you feel the history of Takaoka through the art pieces and enjoy the exhibition. *We accept the order for all Sorori vase based on build to order. The special brochure introducing every Sorori will be on sale on site. 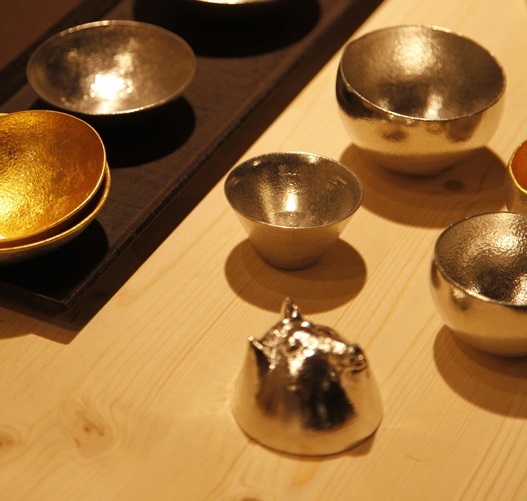 During the exhibition period, we will offer a special experience to enjoy the properties of pure tin using NOUSAKU sake cups. Please take this opportunity to learn about our tin items. In the meantime, the following cherry blossom items are on presale at the shop from Feb 15th. This is a limited supply item and kindly contact the shop for the availability. 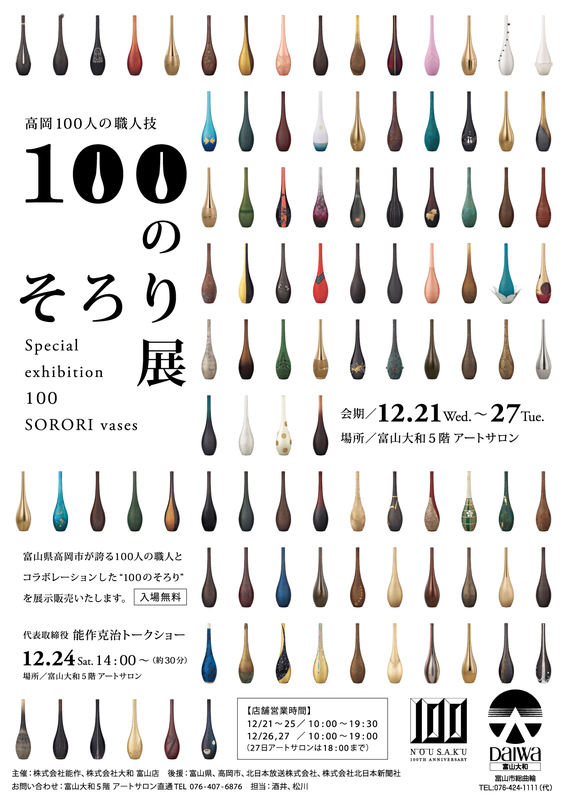 Celebrating the 100th anniversary of our foundation, we will hold the special exhibition “100 Sorori vases” at Matsuya Ginza Department Store. With the aim of introducing the traditions and techniques handed down in our area, we worked with 100 stunning artisans in Takaoka City to give the special finishing to our Sorori vase, which is a key item in a long history of traditional tea ceremony. While preserving the tradition, we together with the artisans would like to cultivate it and pass on to the next generation through this project. We hope you to visit the shop during the period and enjoy the exhibitions. We are pleased to announce our participation in the 83rd Tokyo International Gift Show Spring 2017, held in Tokyo big sight from February 1st (Wed) to 3rd (Fri), 2017. We will be exhibiting about 30 new items developed in collaboration with great designers and companies. If you have a plan to visit the show, we hope you to stop by at our booth to see the pieces. We look forward to seeing you on site. 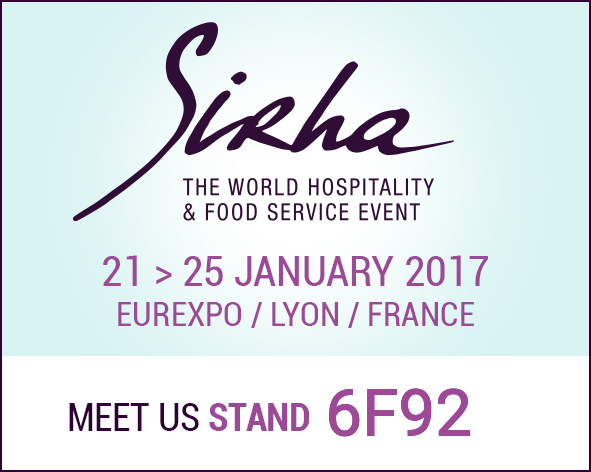 NOUSAKU will be exhibiting at the Sirha exhibition, held in Lyon, France from January 21st (Sat) to 25th (Wed). Gathering more than 180,000 visitors from around the world, the show is held every 2 years exclusively for professionals and known as one of the top trade fairs for the food service and hospitality industry. This will be our third time to exhibit at the show counting from 2011, and we are pleased to introduce our professional collections designed by a French designer, Ms. Sylvie Amar along with new items released this year. It has been three months since we opened our shop at Hakata Hankyu Department Store and we would like to take this opportunity to thank you for all your support by holding a special event. During the event, our president will give a public talk about the great properties of tin while serving drinks using both glass and tin cups for a tasting. We hope we could introduce the new way of enjoying your drinking time with our tin cups. Date: Dec 17th (Sat), from 4 to 5 pm. 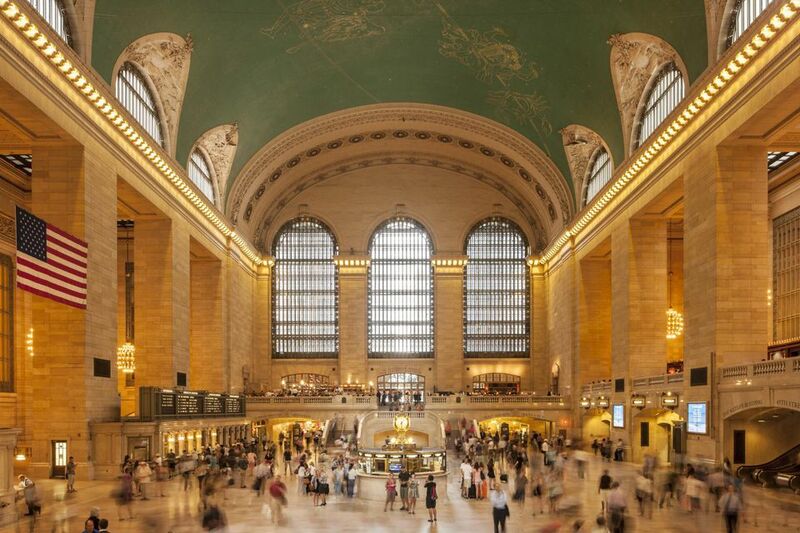 Drinks such as beer, wine and orange juice, and snacks will be served. Note: Underage drinking is prohibited by law. Please refrain from drinking and driving. The seats are available on a first come, first served basis. Please make reservation as early as possible. Reservation is available from the following link. We are pleased to announce that our special items developed in collaboration with a gallery shop in Singapore, Supermama have been showcased at “HIGHLIGHT” hosted by DESIGN KOISHIKAWA. As a satellite exhibition of Tokyo Design Week 2016, the event has been held from October 28th, gathering art and design from Japan and abroad. 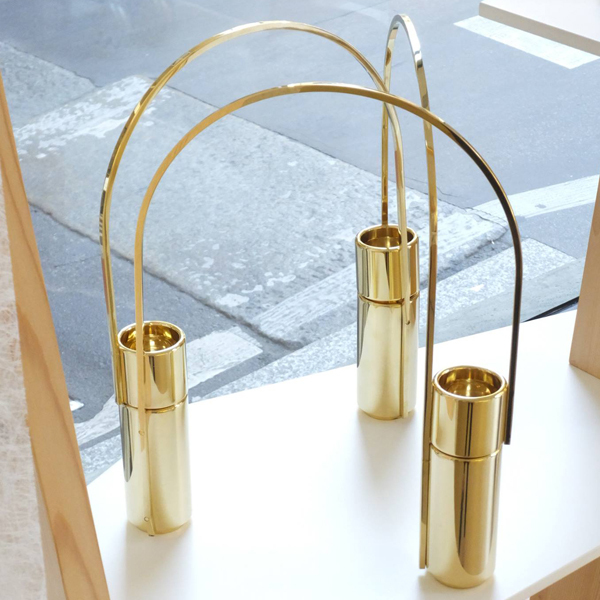 The mirror-finished shiny brass flower vases designed by Mr. Voon Wong unveiled for the first time in Japan. Pure tin flower tray in the motif of the national flower of Singapore, orchid has been exhibited as well. If you have a plan to be in Tokyo during the period, we hope you to stop by at the event to see the pieces. 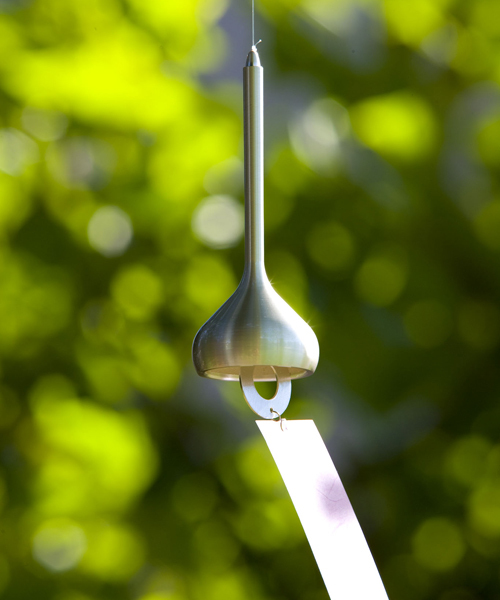 “Japan Creative” is the project which is firmly grounded in Japanese aesthetics and technologies with traditional roots, making “Japanese Creativity” accessible to the world. 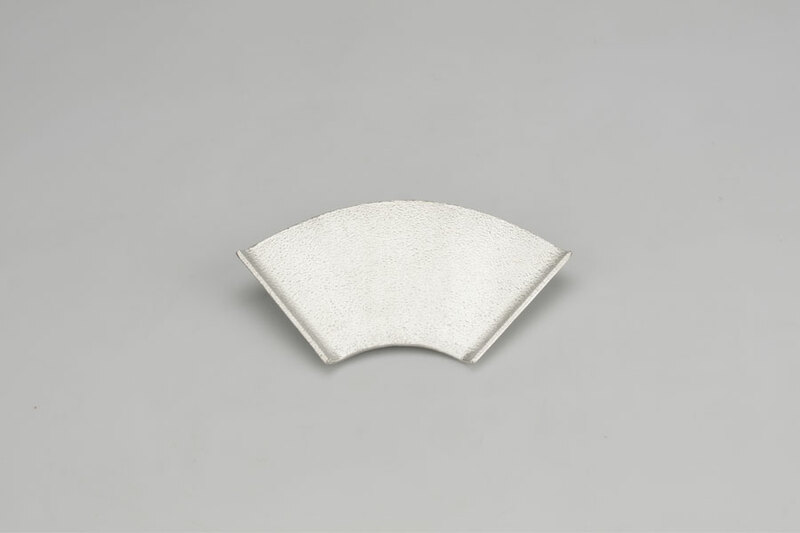 Participating in the project, we developed the beautiful plate sets in collaboration with designers, Claesson Koivisto Rune and it will be showcased at “Japan Creative Talk Session 2016”, held in SEIBU SHIBUYA B building from Oct 25th to November 3rd. In the meantime, our president Mr. Nousaku will give a public talk at the venue. If you have a plan to be in Tokyo on the day, we hope you to stop by and enjoy the talk. Venue: on the first basement floor, living edition in SEIBU SHIBUYA Building B. * Numbered tickets will be issued around 6pm. Please be seated in numerical order. 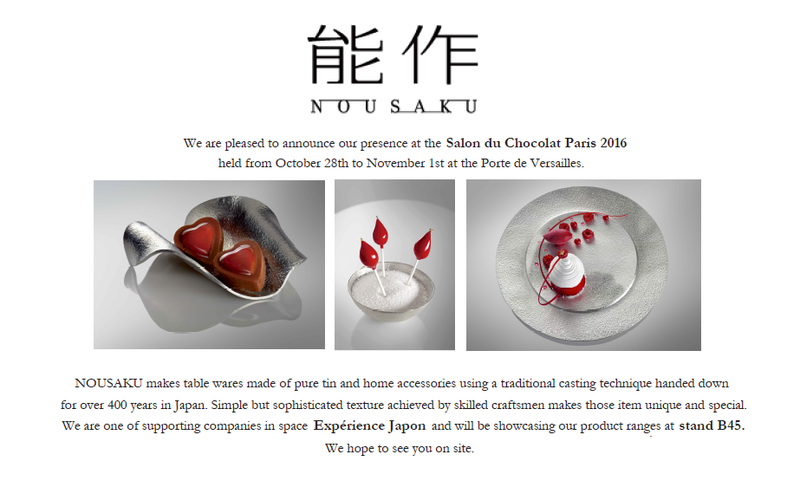 NOUSAKU will be exhibiting at Salon du Saké 2016, held in Paris from October 22nd (Sat) to 24th (Mon), 2016. Known as one of the largest Japanese sake events in Europe, it gathers lots of buyers and people being familiar with Japanese Sake, and gives them an opportunity to socialize with Sake breweries. From 22nd to 23rd, it will be opened to the public and you can enjoy special programs such as workshops by famous chefs and sommeliers. If you have a plan to be in Paris during the period, we hope you to stop by at the event center. We are pleased to announce our 100th anniversary this year. 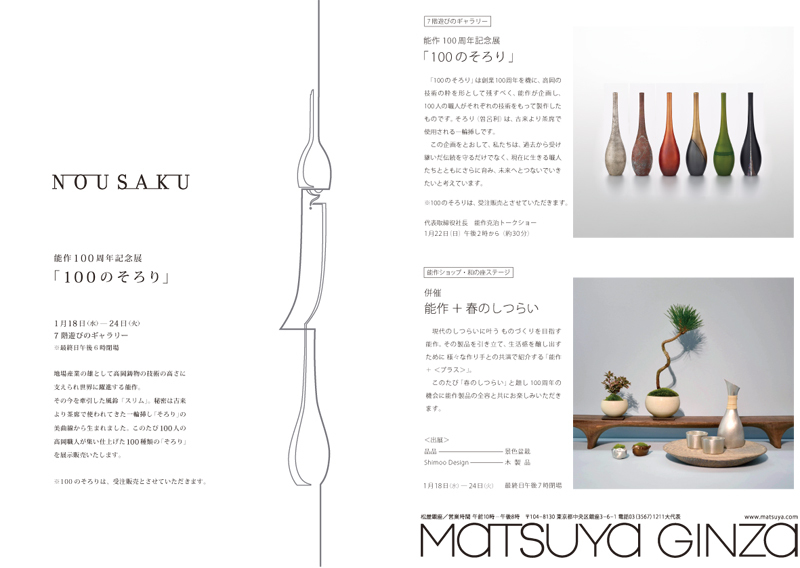 Celebrating the anniversary, we will hold a special exhibition featuring Sorori – bestselling flower vase at NOUSAKU Fukuoka Mitsukoshi. 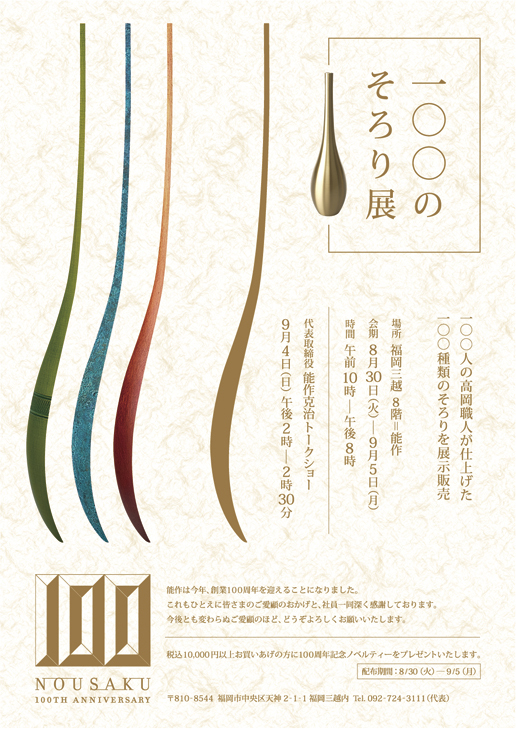 We are showcasing 100pcs of Sorori which embody craftsmanship and finishing technique in Takaoka. 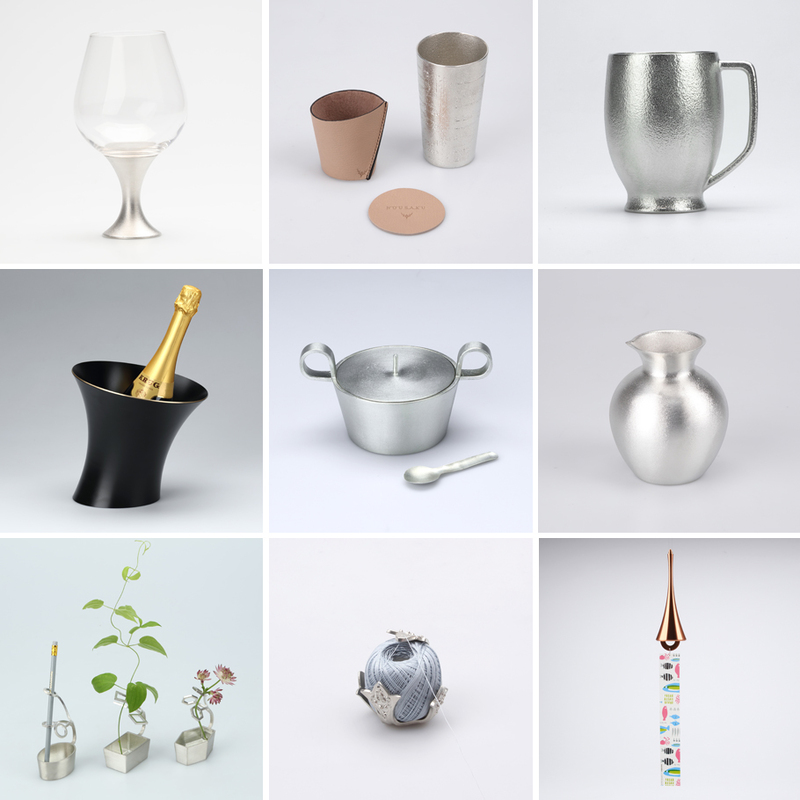 Every piece is applied different finishing by 100 craftsman such as coloring, engraving and polishing, making full use of their experience and creativity. After Fukuoka Mitsukoshi, we will hold the same exhibition at other NOUSAKU shops in Japan sequentially. *We accept the order for each Sorori but please be noted that these are produced on order. In the meantime, beautiful moon-inspired items will be exclusively on sale at this shop. In addition, customers who purchase over JPY 10,800 at the shop will receive a special gift. Please don’t miss your chance to get the item! 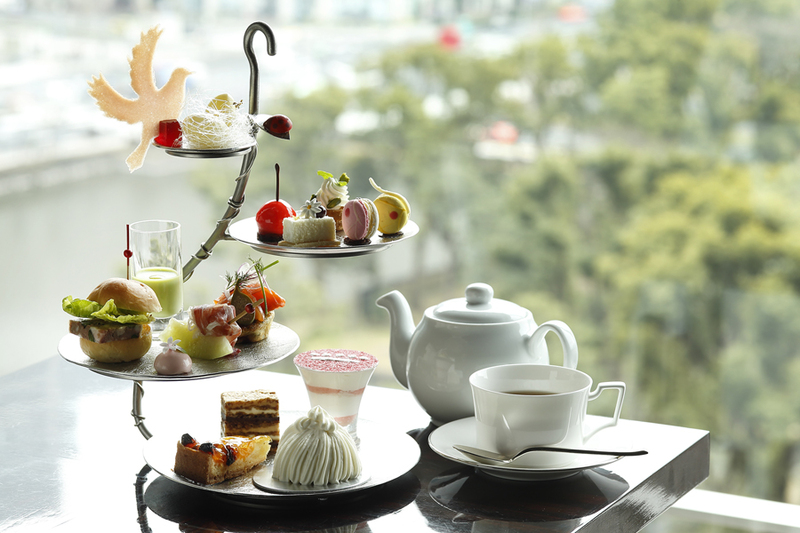 We hope you visit Fukuoka Mitsukoshi shop during this special period. 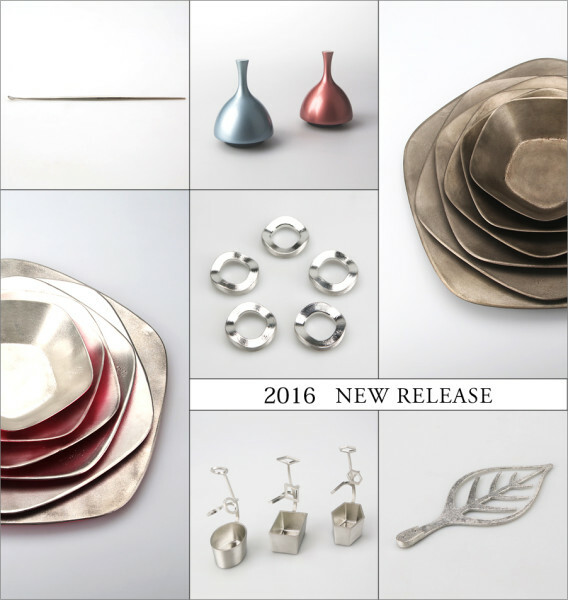 NOUSAKU will be exhibiting at upcoming NY NOW summer 2016, held from August 21st (Sun) to 24th (Wed) at Jacob K. Javits Convention Center. 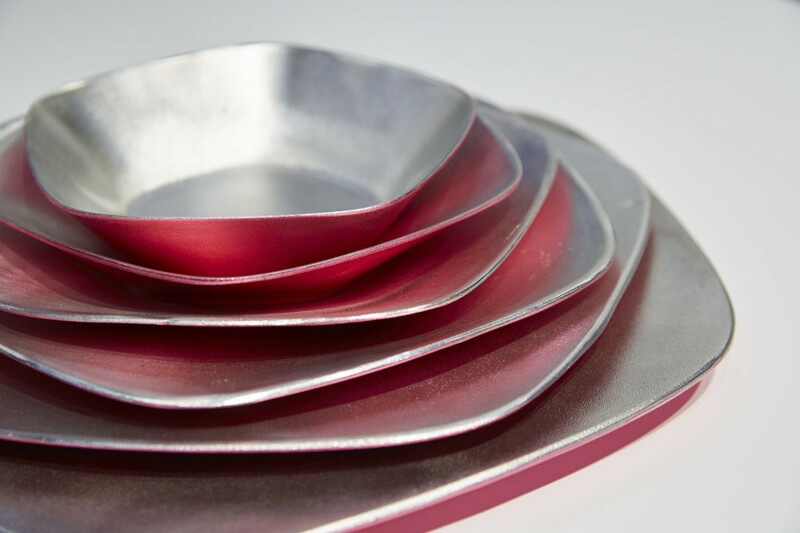 Along with our regular items, we will showcase special items in collaboration with supermama and beautiful plate set designed by Cleasson Koivisto Rune under ‘Japan Creative’ project. 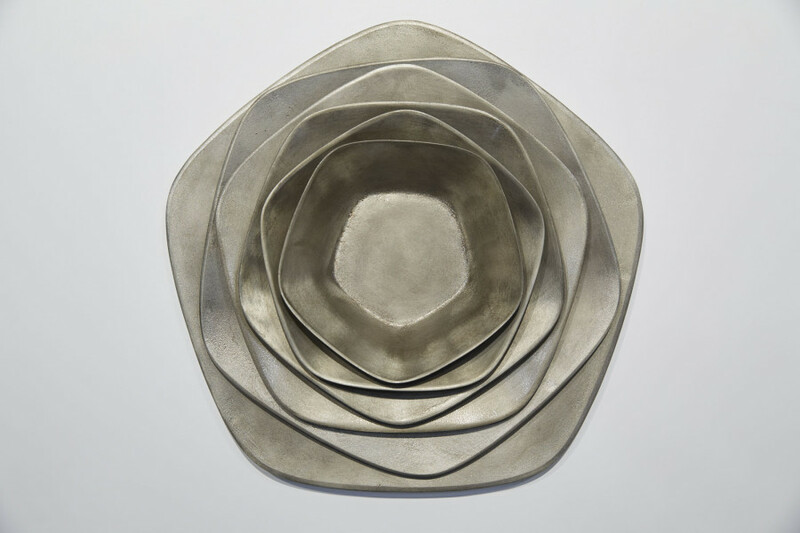 If you have a plan to visit the show, we hope you to visit the show to see the pieces. Featuring ‘TOYAMA MODEL,’ their product development methodology, they will introduce the process as well as their activities in marketing and branding. On Aug 10th they will hold a talk show about a product development and the design, inviting our president and Ms. Rina Ono, the designer of KAGO series, as speakers. 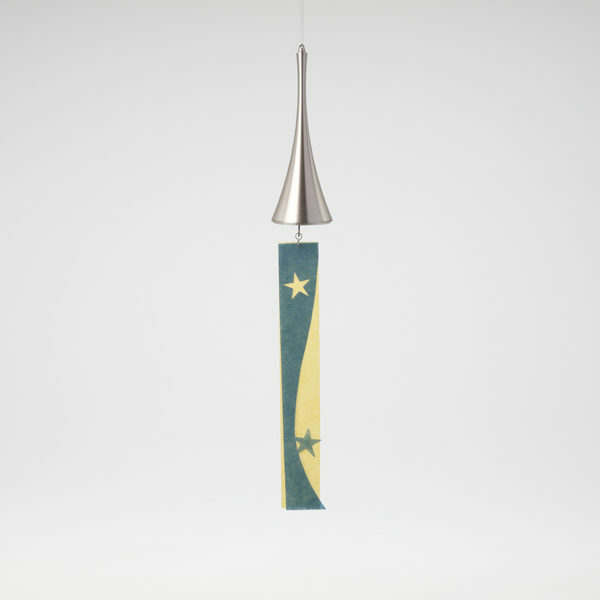 NOUSAKU wind bells and KAGO series will be showcased as the past works so we hope you to visit the museum if you have a chance to be in Taipei during the period. 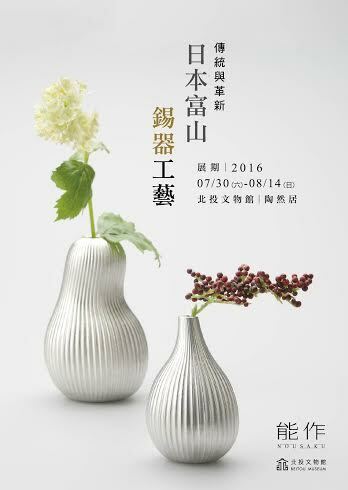 We are pleased to announce our special exhibition at Beitou Museum in Taipei, from July 30th to August 14th. Based in Beitou renowned for its hot spring, it was originally built as a hot spring hotel under Japanese rule, later converted to the Taiwanese beautiful museum. In addition to our regular tin items, we will introduce how the items are made by our craftsmen, by showcasing wooden molds and casts. 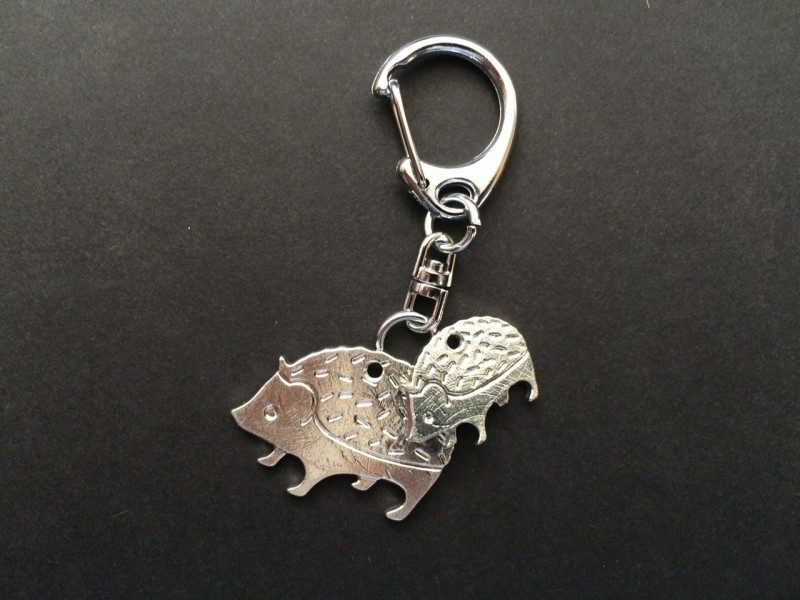 During the exhibition, our items will also be available to purchase on site. To celebrate the opening, we will hold our president speech and Sake tasting event using tin cups on the first day, July 30th. 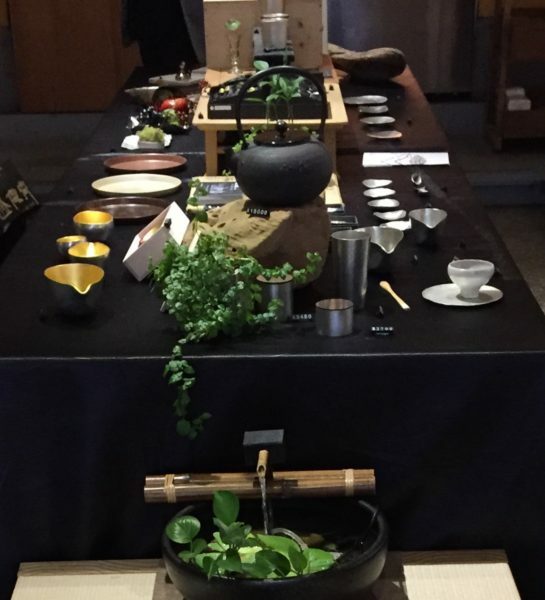 We are happy to offer the special experience to enjoy NOUSAKU not only by seeing the pieces, but also by learning our techniques and history, and tasting delicious Sake. If you have a plan to go to Taipei during the period, we hope you to stop by at the museum. 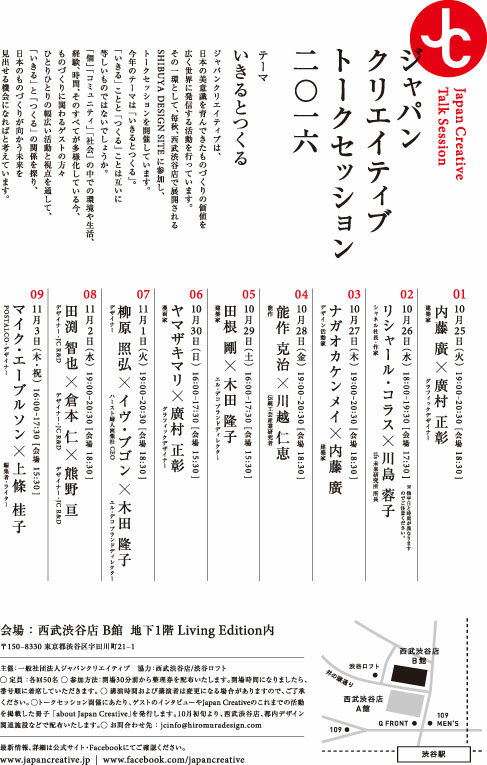 We are pleased to announce our participation in “Interior lifestyle Tokyo” held in Tokyo big sight from June 1st (Wed) to 3rd (Fri). We will showcase our basic lineups as well as new items. 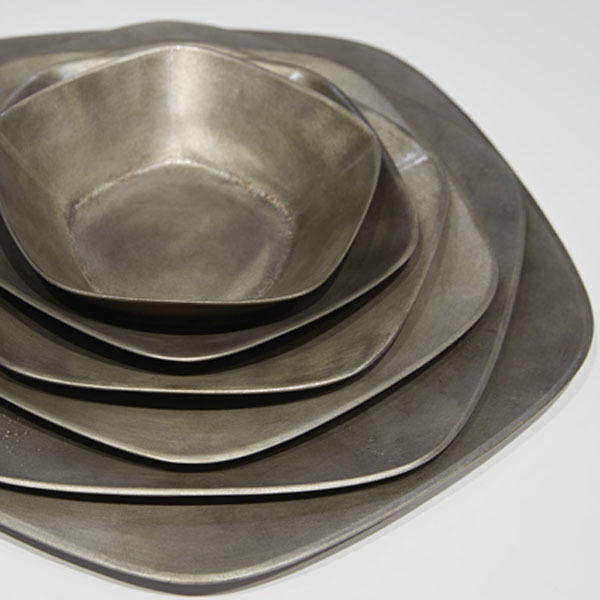 If you have a plan to visit the show, we hope you to stop by at our booth to see the pieces. We are pleased to announce that our shop in Nihombashi Mitsukoshi will hold a special exhibition and our president speech, celebrating the 7th anniversary. 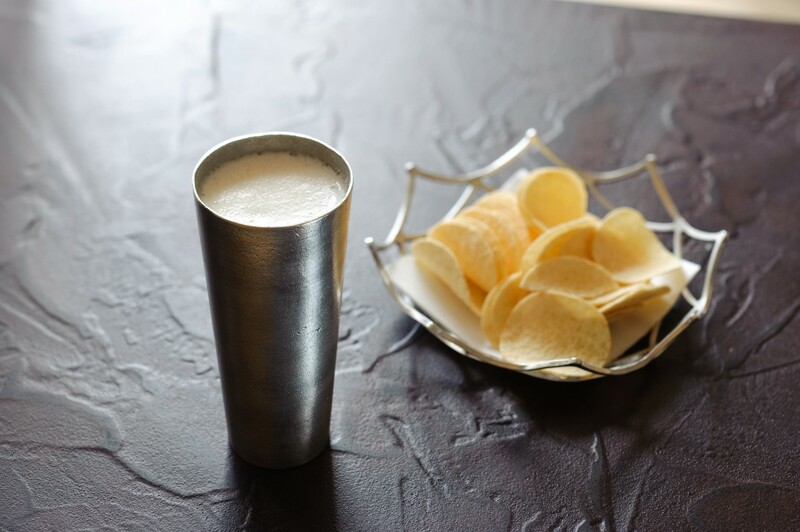 During the exhibition period, we also offer a special experience to enjoy the property of pure tin using NOUSAKU sake cups. 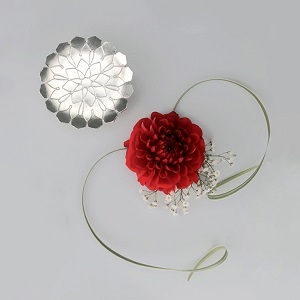 In the meantime, the exclusive item “Flower tray – Dahlia” will be released at the shop. 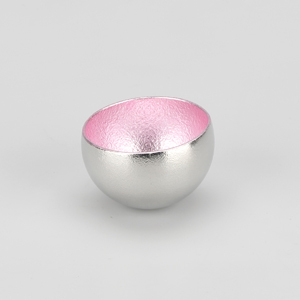 With this beautiful item, how about express your gratitude on Mother’s day? During the period, customers who purchase over JPY 10,800 at the shop will receive a special gift. *The item is presented only to the first 100 arrivals and limited to one per customer. We hope you to stop by at the shop and enjoy NOUSAKU items. Milan design week 2016 is now coming up and we are happy to announce the detail information. 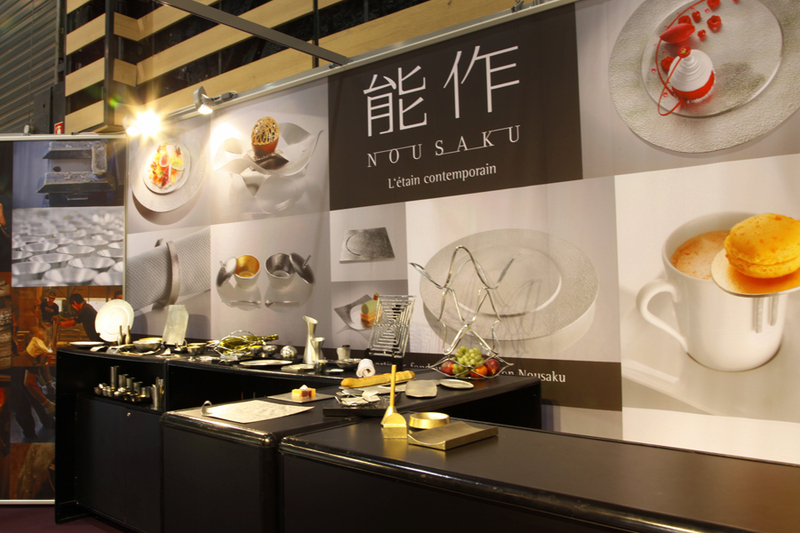 If you have a plan to visit Milan during the period, we hope you will stop by and enjoy NOUSAKU pieces. We are pleased to announce our first participation in Milan Design Week 2016 from Apr 12th (Tue) to 17th (Sun). In collaboration with Wallpaper* Handmade project(*), our newly developed items designed by Mr. Giulio Lacchetti will be showcased at the exhibition. (*)The link is for 2015. 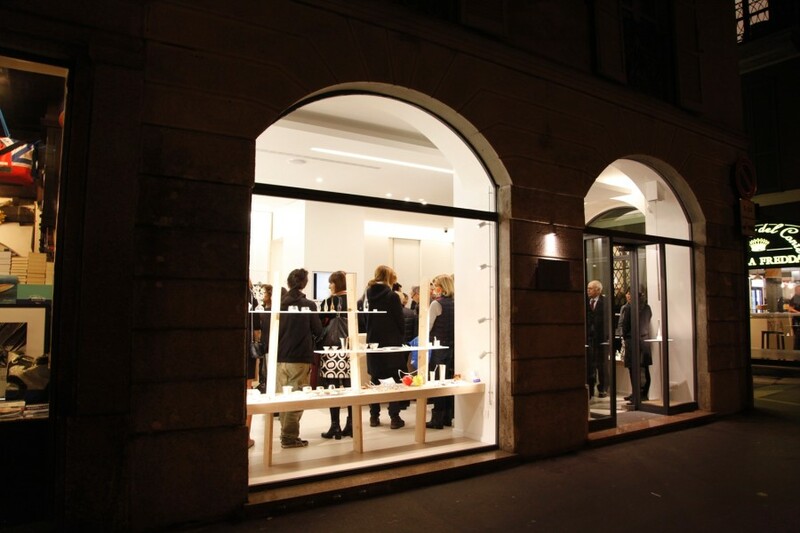 In the meantime, we will hold a special exhibition at our Milan Shop, showcasing latest pieces as well as regular items. 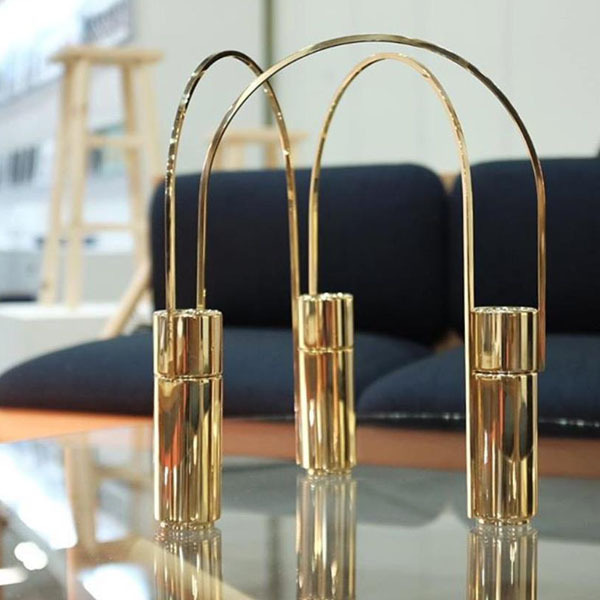 Brass mirror shine flower vases designed by Mr. Voon Wong, a Singaporean designer, in collaboration with Supermama which has just released at MAISON & OBJET ASIA. 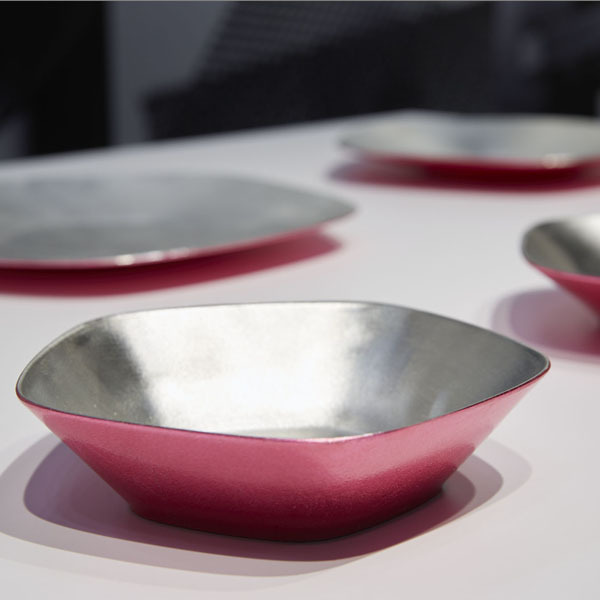 Tin Plates designed by Claesson Koivisto Rune, a Swedish design team as apart of Japan Creative project which has just released at NY NOW 2016. 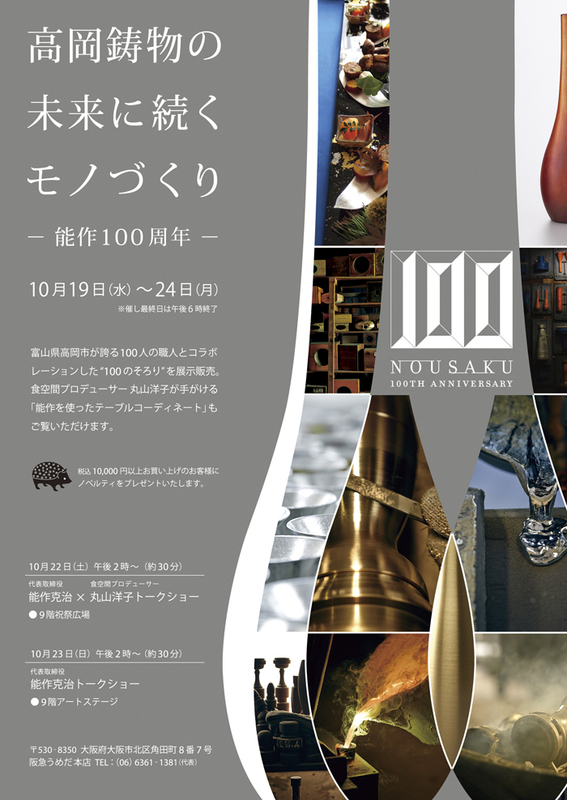 As the special event, we will hold Sake tasting event using Nousaku sake cup offering the experience of tin properties. 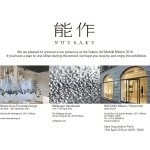 Please RSVP by Apr 12th to sales@nousaku.co.jp, with the number of guests. If you have a plan to visit Milan during the period, we hope you to come to the shop and enjoy the exhibition and the event. *Sake tasting event will be started from 6:00 PM on 13th (Wed). 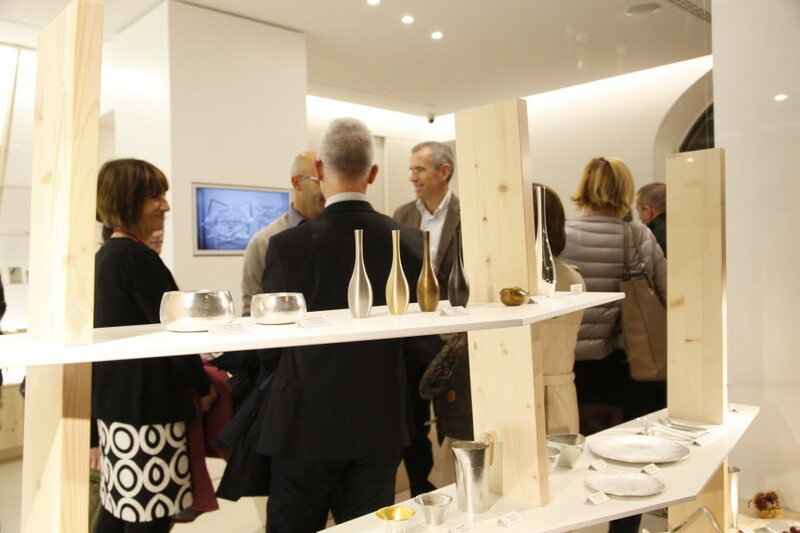 For the detail information, please refer to Brera Design District 2016 website.